3 Course content: 1. Introduction. 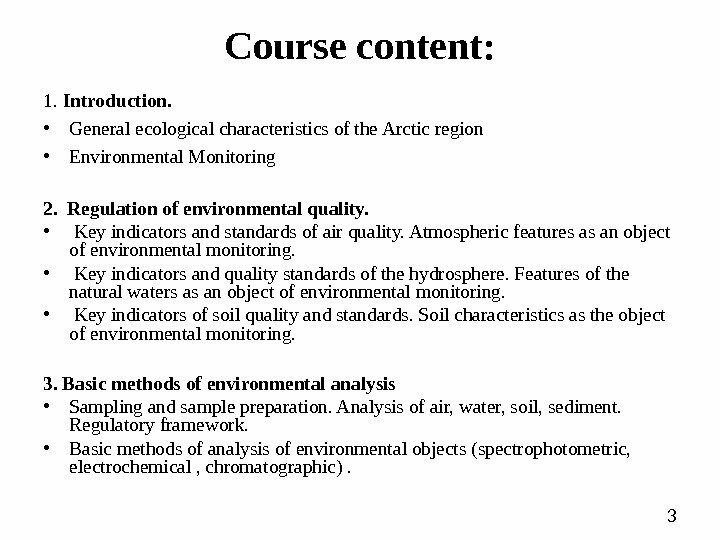 • General ecological characteristics of the Arctic region • Environmental Monitoring 2. Regulation of environmental quality. • Key indicators and standards of air quality. Atmospheric features as an object of environmental monitoring. 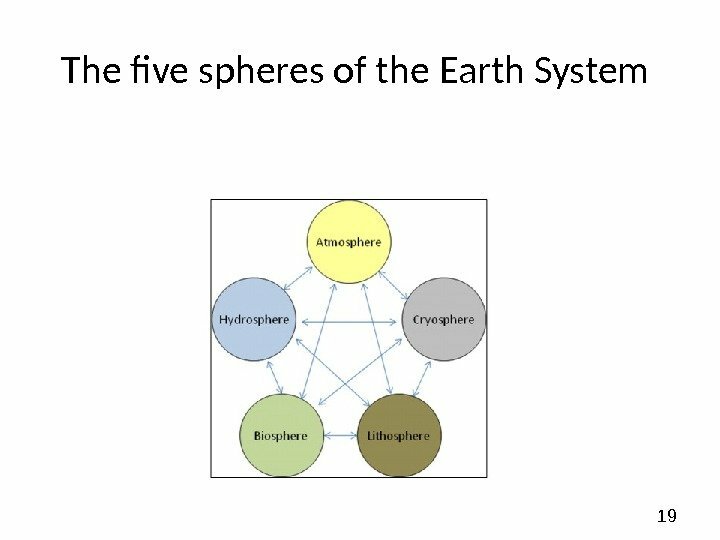 • Key indicators and quality standards of the hydrosphere. Features of the natural waters as an object of environmental monitoring. • Key indicators of soil quality and standards. Soil characteristics as the object of environmental monitoring. 3. 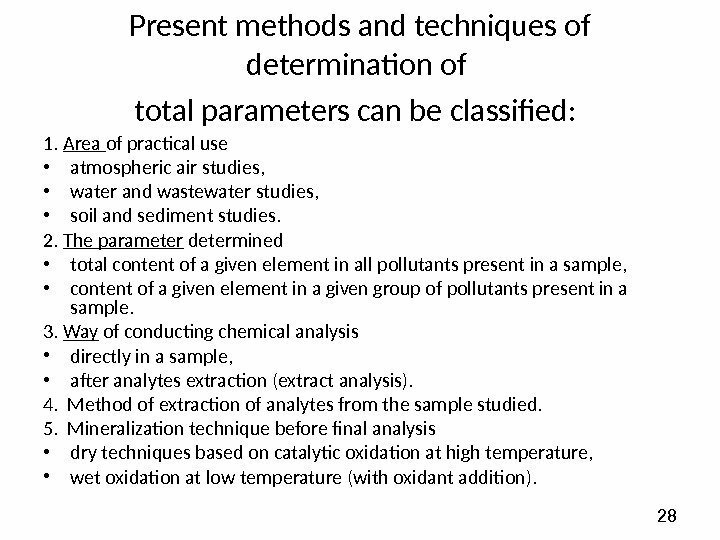 Basic methods of environmental analysis • Sampling and sample preparation. Analysis of air, water, soil, sediment. Regulatory framework. 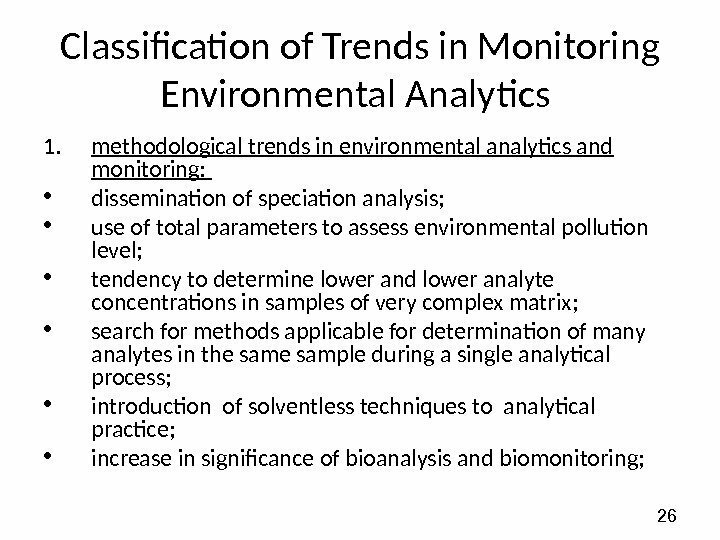 • Basic methods of analysis of environmental objects (spectrophotometric, electrochemical , chromatographic). 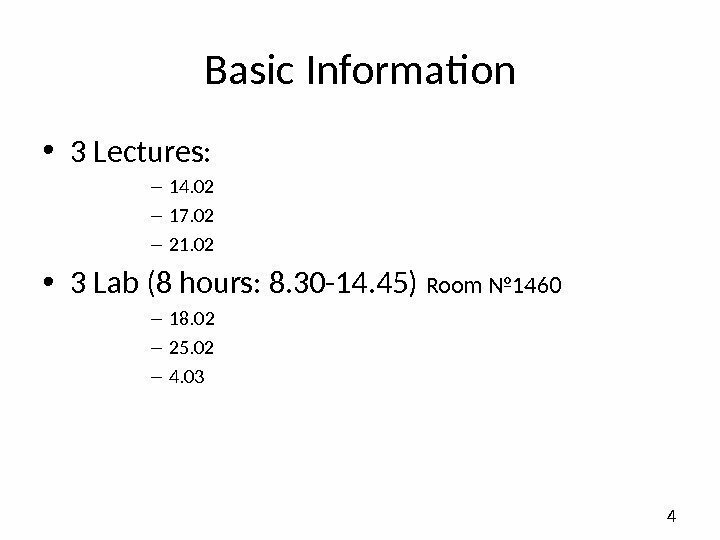 4 Basic Information • 3 Lectures: – 14. 02 – 17. 02 – 21. 02 • 3 Lab (8 hours: 8. 30 -14. 45) Room № 1460 – 18. 02 – 25. 02 – 4. 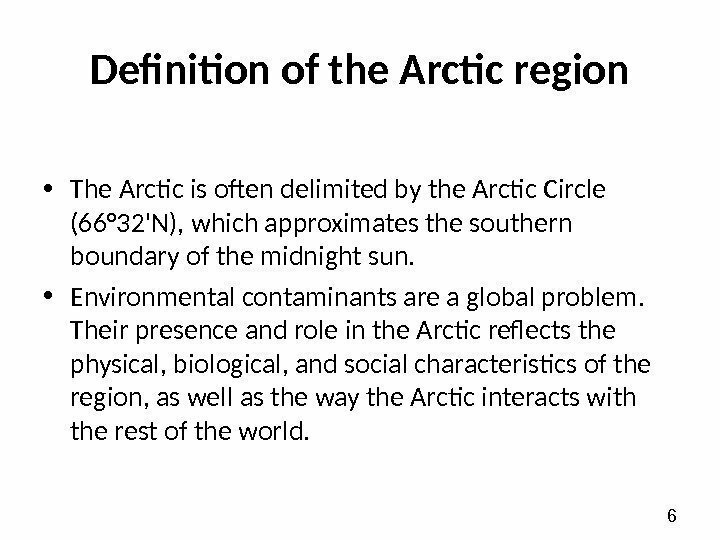 6 Definition of the Arctic region • The Arctic is often delimited by the Arctic Circle (66° 32’N), which approximates the southern boundary of the midnight sun. • Environmental contaminants are a global problem. Their presence and role in the Arctic reflects the physical, biological, and social characteristics of the region, as well as the way the Arctic interacts with the rest of the world. 8 Arctic Region • Polar ecosystems exist under extreme environmental conditions , including cold temperatures, large seasonal fluctuations in incoming solar radiation, extensive snow and ice cover, and short growing seasons. 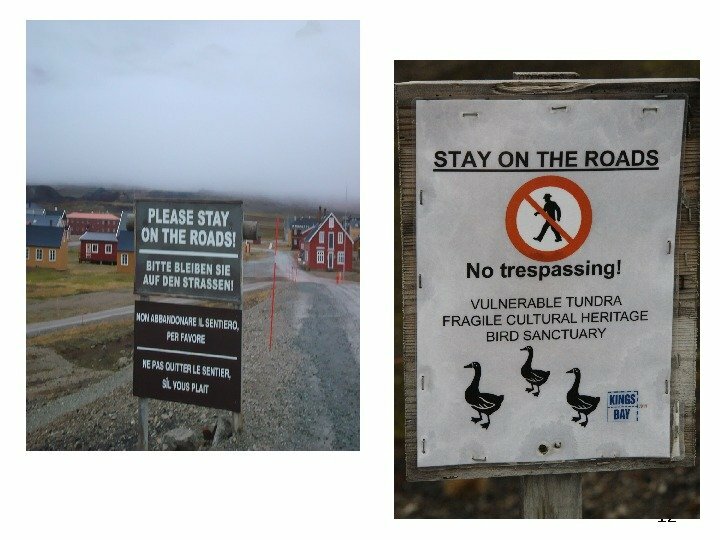 • The Arctic region also includes the tundra — meaning “treeless plain”— ecosystem. 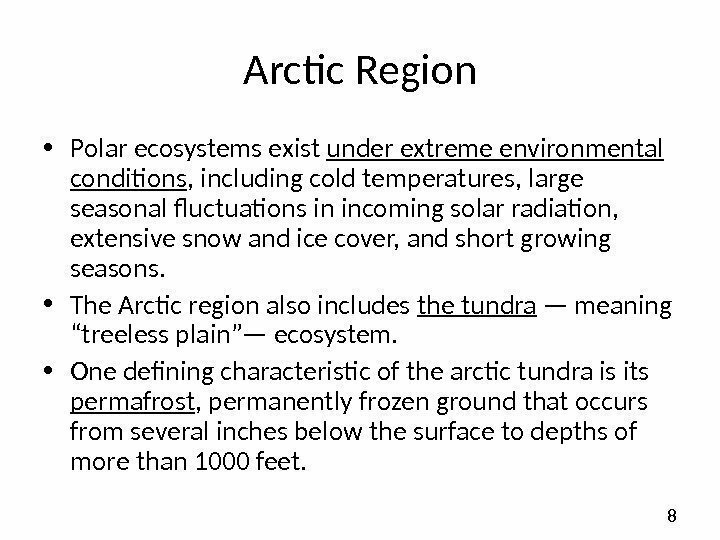 • One defining characteristic of the arctic tundra is its permafrost , permanently frozen ground that occurs from several inches below the surface to depths of more than 1000 feet. 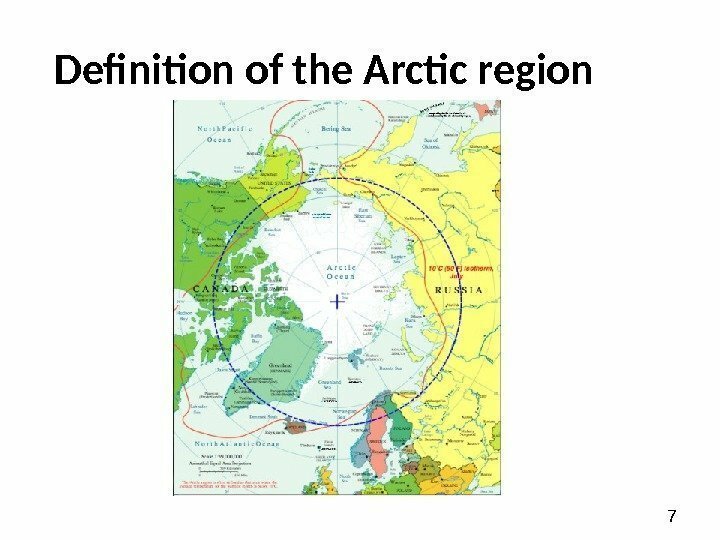 9 Arctic Region • The arctic tundra is circumpolar , meaning that it is an ecosystem surrounding the polar region, above roughly 60 degrees north latitude. 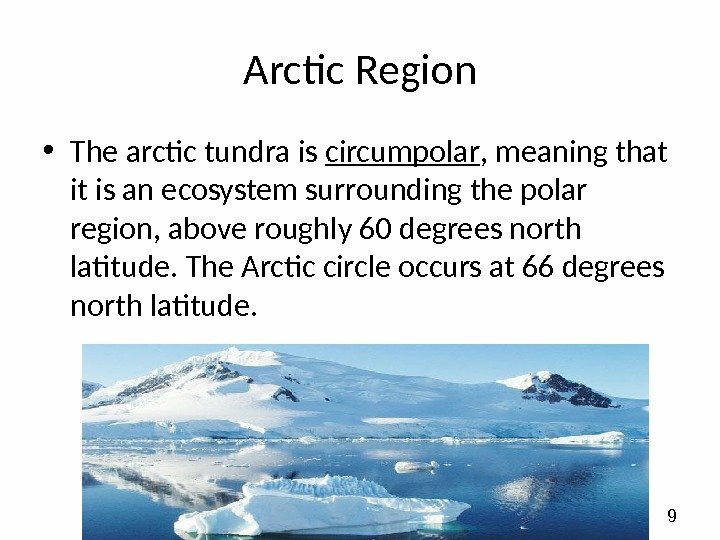 The Arctic circle occurs at 66 degrees north latitude. 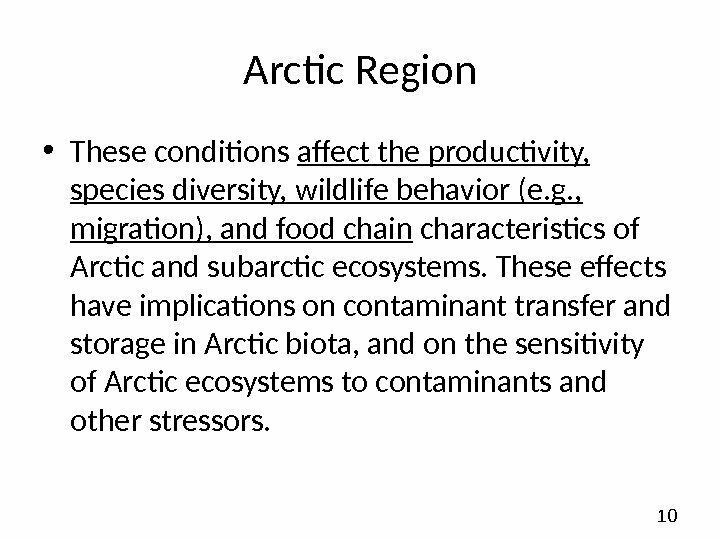 10 Arctic Region • These conditions affect the productivity, species diversity, wildlife behavior (e. g. , migration), and food chain characteristics of Arctic and subarctic ecosystems. 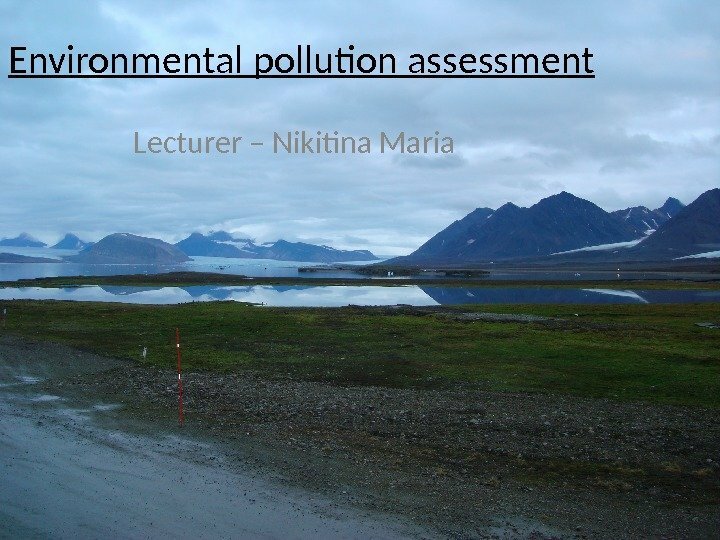 These effects have implications on contaminant transfer and storage in Arctic biota, and on the sensitivity of Arctic ecosystems to contaminants and other stressors. 112. 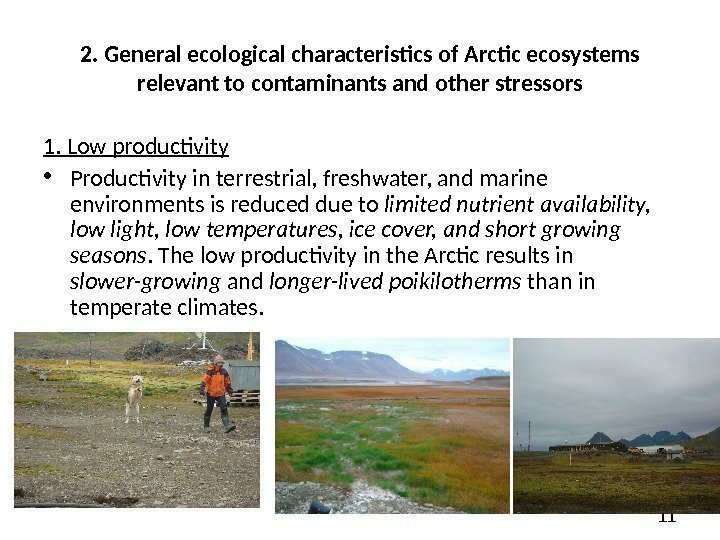 General ecological characteristics of Arctic ecosystems relevant to contaminants and other stressors 1. Low productivity • Productivity in terrestrial, freshwater, and marine environments is reduced due to limited nutrient availability, low light, low temperatures, ice cover, and short growing seasons. The low productivity in the Arctic results in slower-growing and longer-lived poikilotherms than in temperate climates. 132. 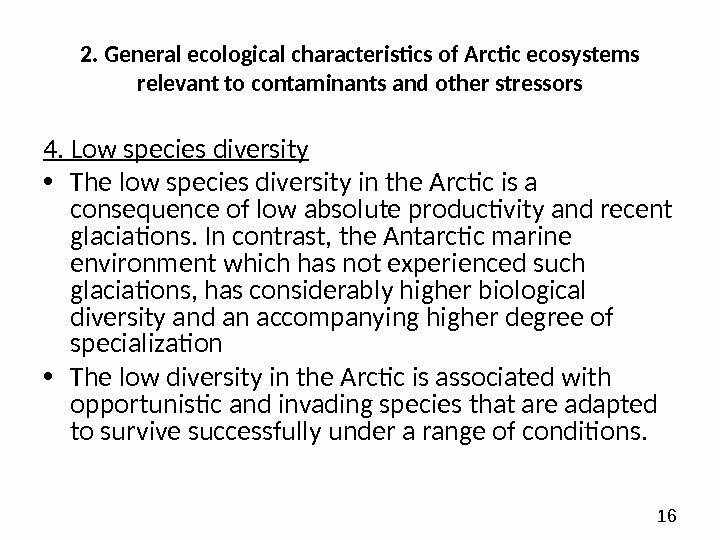 General ecological characteristics of Arctic ecosystems relevant to contaminants and other stressors 2. 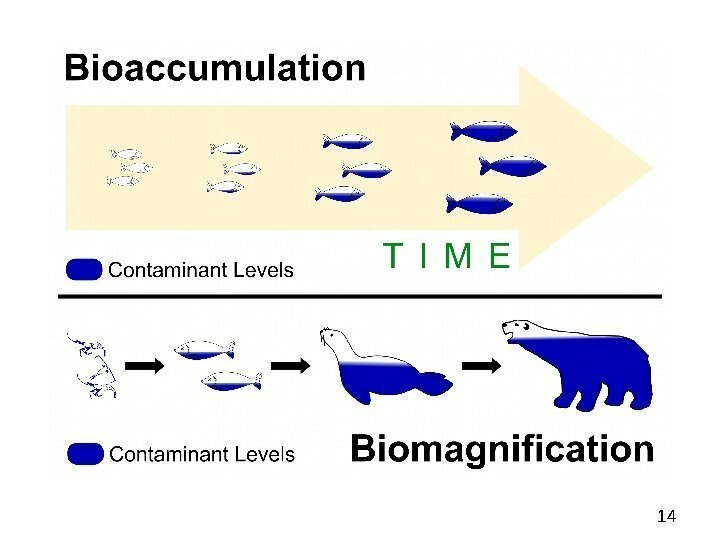 Bioaccumulation and biomagnification Levels of some contaminants, particularly metals, in specific tissues and organs of a number of temperate and Arctic species increase with age. This is due to bioaccumulation , i. e. , increases in contaminant concentrations in biota with continued exposure over time. 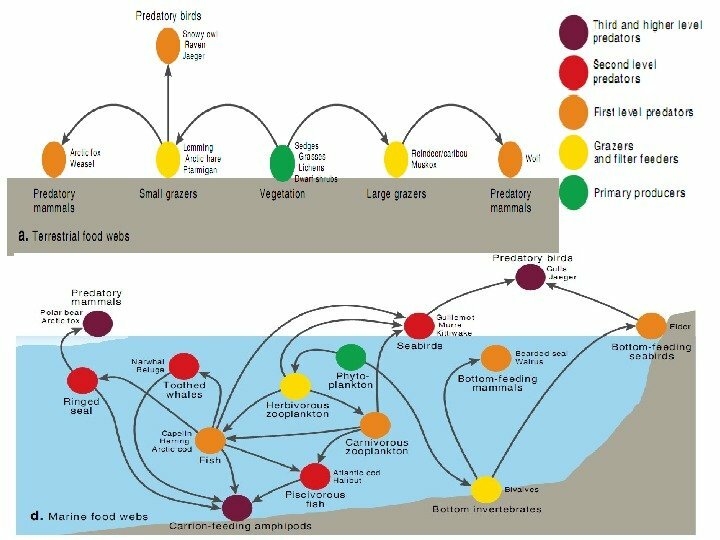 Some organic contaminants become further concentrated in animals with each successive step up a food chain, a process called biomagnification. 152. 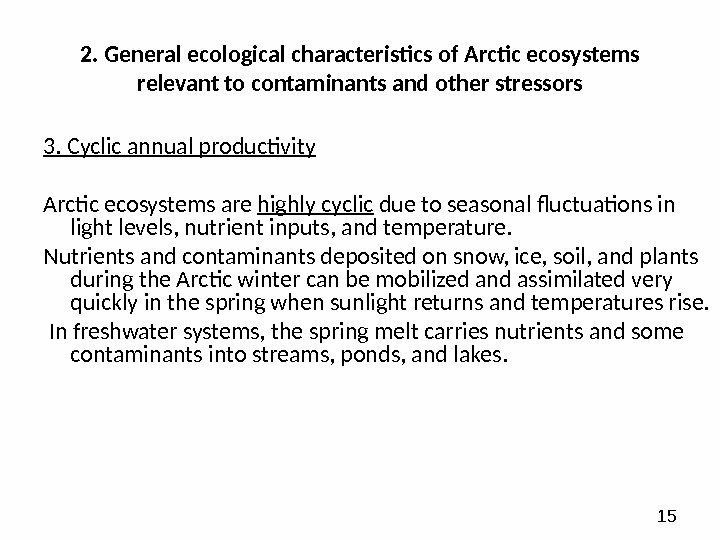 General ecological characteristics of Arctic ecosystems relevant to contaminants and other stressors 3. Cyclic annual productivity Arctic ecosystems are highly cyclic due to seasonal fluctuations in light levels, nutrient inputs, and temperature. Nutrients and contaminants deposited on snow, ice, soil, and plants during the Arctic winter can be mobilized and assimilated very quickly in the spring when sunlight returns and temperatures rise. In freshwater systems, the spring melt carries nutrients and some contaminants into streams, ponds, and lakes. 162. 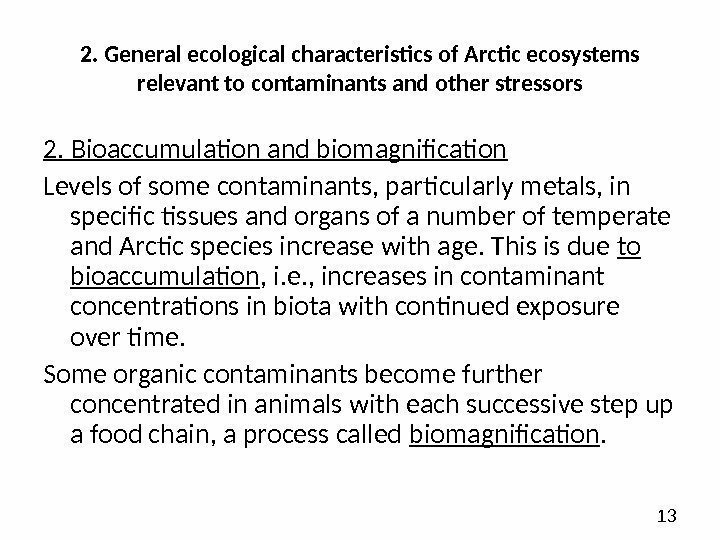 General ecological characteristics of Arctic ecosystems relevant to contaminants and other stressors 4. Low species diversity • The low species diversity in the Arctic is a consequence of low absolute productivity and recent glaciations. In contrast, the Antarctic marine environment which has not experienced such glaciations, has considerably higher biological diversity and an accompanying higher degree of specialization • The low diversity in the Arctic is associated with opportunistic and invading species that are adapted to survive successfully under a range of conditions. 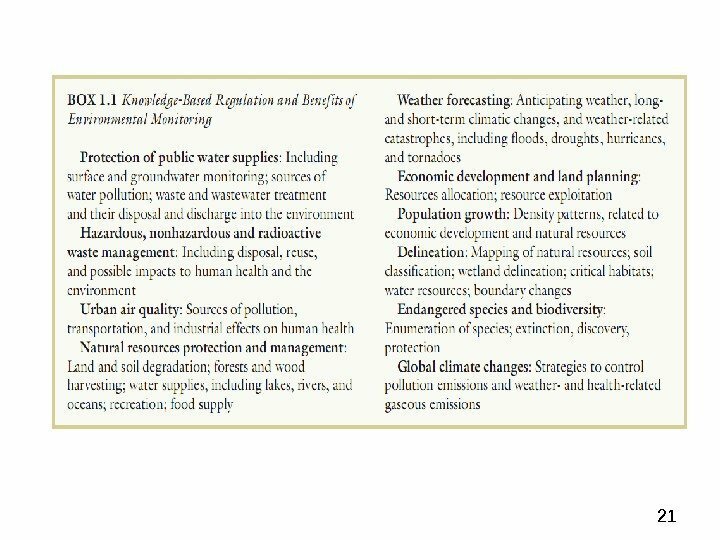 18 Environmental monitoring can be defined as the systematic sampling of air, water, soil, and biota in order to observe and study the environment, as well as to derive knowledge from this process. (Artiola et al. , 2004; Wiersma, 2004). 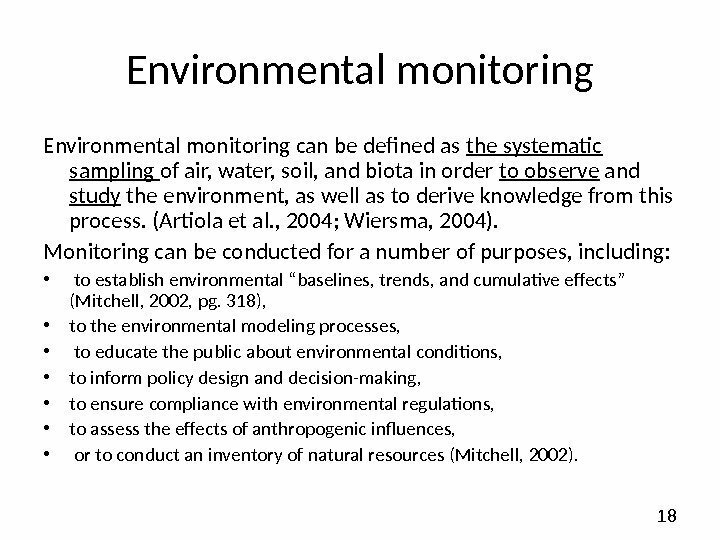 Monitoring can be conducted for a number of purposes, including: • to establish environmental “baselines, trends, and cumulative effects” (Mitchell, 2002, pg. 318), • to the environmental modeling processes, • to educate the public about environmental conditions, • to inform policy design and decision-making, • to ensure compliance with environmental regulations, • to assess the effects of anthropogenic influences, • or to conduct an inventory of natural resources (Mitchell, 2002). 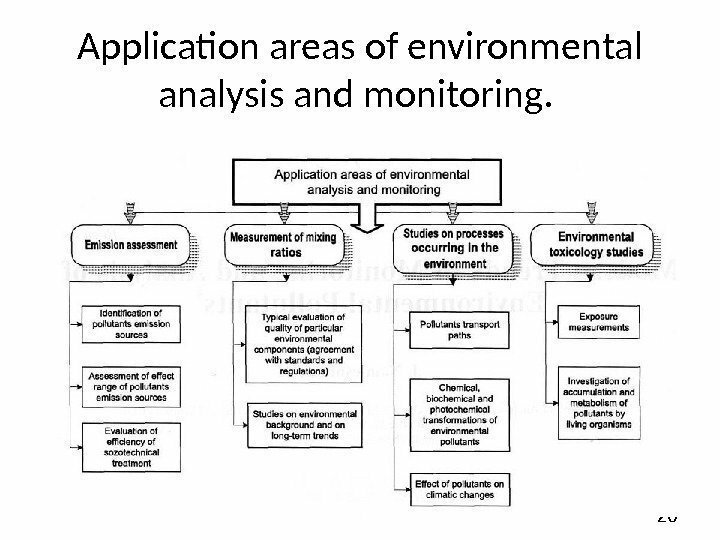 20 Application areas of environmental analysis and monitoring. 24 Monitoring 1. 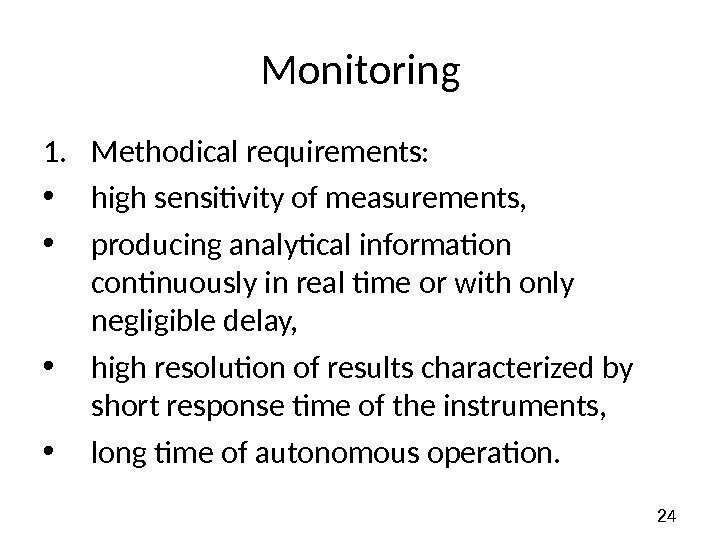 Methodical requirements: • high sensitivity of measurements, • producing analytical information continuously in real time or with only negligible delay, • high resolution of results characterized by short response time of the instruments, • long time of autonomous operation. 25 Monitoring 2. 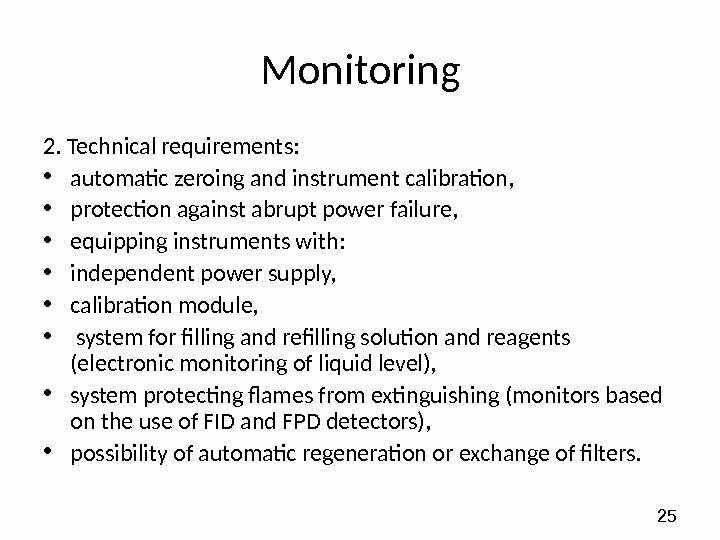 Technical requirements: • automatic zeroing and instrument calibration, • protection against abrupt power failure, • equipping instruments with: • independent power supply, • calibration module, • system for filling and refilling solution and reagents (electronic monitoring of liquid level), • system protecting flames from extinguishing (monitors based on the use of FID and FPD detectors), • possibility of automatic regeneration or exchange of filters. 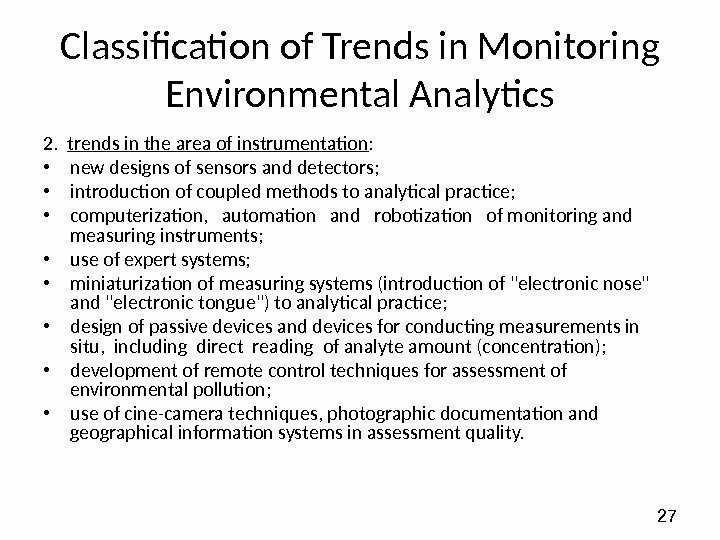 27 Classification of Trends in Monitoring Environmental Analytics 2. trends in the area of instrumentation : • new designs of sensors and detectors; • introduction of coupled methods to analytical practice; • computerization, automation and robotization of monitoring and measuring instruments; • use of expert systems; • miniaturization of measuring systems (introduction of «electronic nose» and «electronic tongue») to analytical practice; • design of passive devices and devices for conducting measurements in situ, including direct reading of analyte amount (concentration); • development of remote control techniques for assessment of environmental pollution; • use of cine-camera techniques, photographic documentation and geographical information systems in assessment quality. 28 Present methods and techniques of determination of total parameters can be classified: 1. Area of practical use • atmospheric air studies, • water and wastewater studies, • soil and sediment studies. 2. 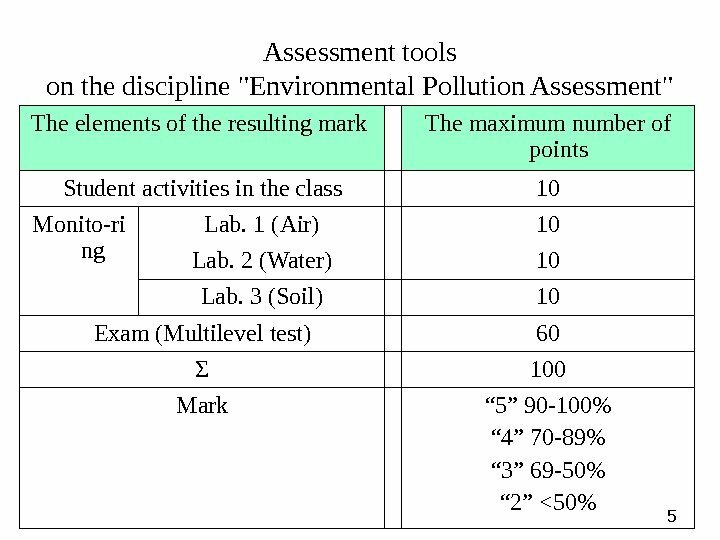 The parameter determined • total content of a given element in all pollutants present in a sample, • content of a given element in a given group of pollutants present in a sample. 3. Way of conducting chemical analysis • directly in a sample, • after analytes extraction (extract analysis). 4. Method of extraction of analytes from the sample studied. 5. Mineralization technique before final analysis • dry techniques based on catalytic oxidation at high temperature, • wet oxidation at low temperature (with oxidant addition). 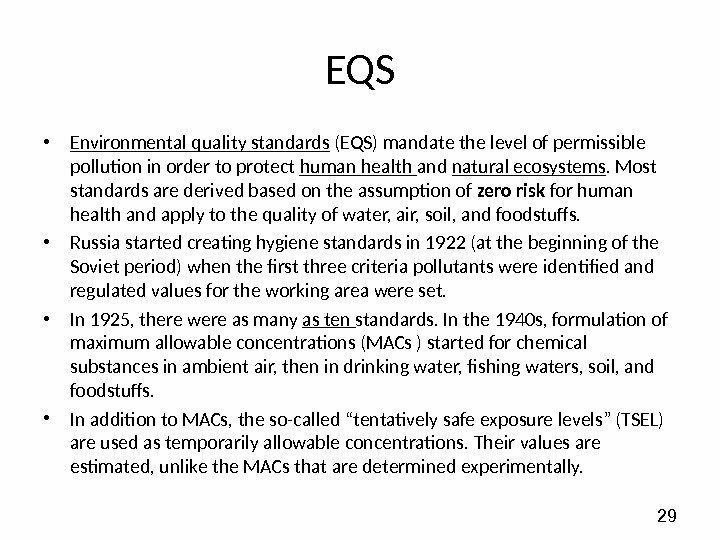 29 EQS • Environmental quality standards (EQS) mandate the level of permissible pollution in order to protect human health and natural ecosystems. Most standards are derived based on the assumption of zero risk for human health and apply to the quality of water, air, soil, and foodstuffs. 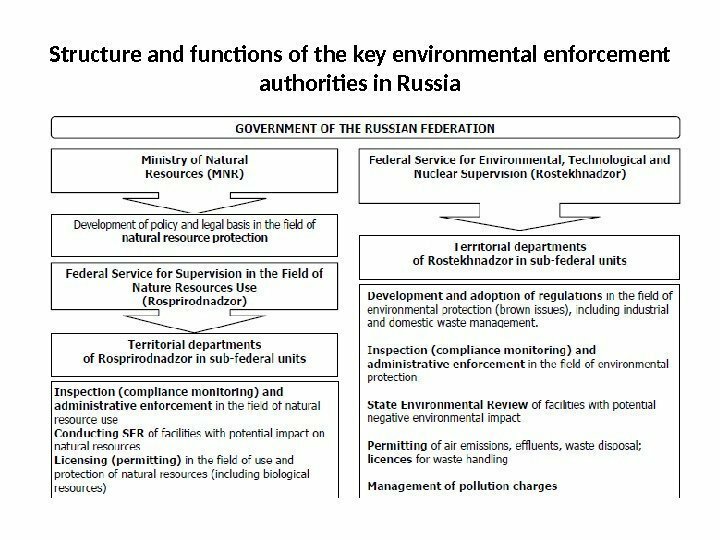 • Russia started creating hygiene standards in 1922 (at the beginning of the Soviet period) when the first three criteria pollutants were identified and regulated values for the working area were set. • In 1925, there were as many as ten standards. In the 1940 s, formulation of maximum allowable concentrations (MACs ) started for chemical substances in ambient air, then in drinking water, fishing waters, soil, and foodstuffs. • In addition to MACs, the so-called “tentatively safe exposure levels” (TSEL) are used as temporarily allowable concentrations. Their values are estimated, unlike the MACs that are determined experimentally. 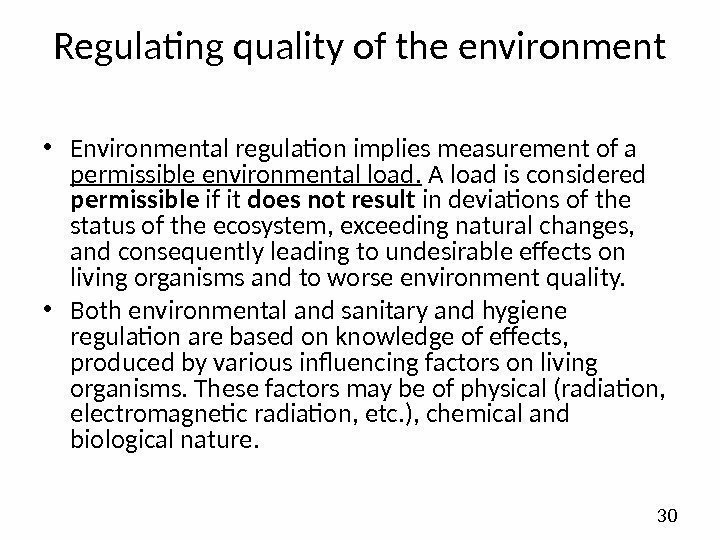 30 Regulating quality of the environment • Environmental regulation implies measurement of a permissible environmental load. A load is considered permissible if it does not result in deviations of the status of the ecosystem, exceeding natural changes, and consequently leading to undesirable effects on living organisms and to worse environment quality. • Both environmental and sanitary and hygiene regulation are based on knowledge of effects, produced by various influencing factors on living organisms. These factors may be of physical (radiation, electromagnetic radiation, etc. ), chemical and biological nature. 31 Regulating quality of the environment • Establishment of environment quality and quality of food is based on the impact threshold concept. • Threshold concentration is a minimum dose of a substance, whose impact may cause changes in an organism beyond physiological and adaptive reactions, or latent (temporally compensated) pathology. 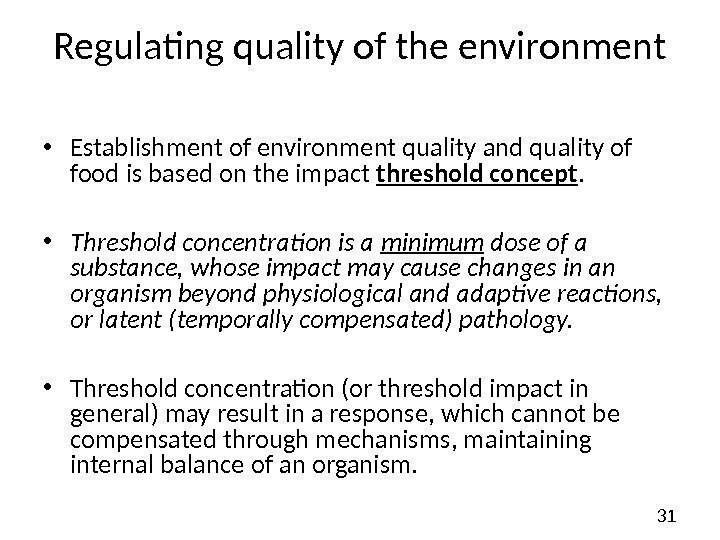 • Threshold concentration (or threshold impact in general) may result in a response, which cannot be compensated through mechanisms, maintaining internal balance of an organism. 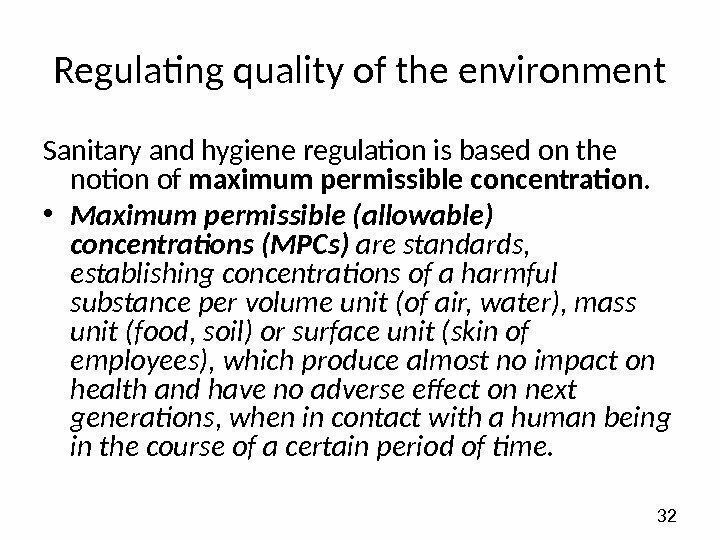 32 Regulating quality of the environment Sanitary and hygiene regulation is based on the notion of maximum permissible concentration. • Maximum permissible (allowable) concentrations (MPCs) are standards, establishing concentrations of a harmful substance per volume unit (of air, water), mass unit (food, soil) or surface unit (skin of employees), which produce almost no impact on health and have no adverse effect on next generations, when in contact with a human being in the course of a certain period of time. 33 Regulating quality of the environment Therefore sanitary and hygiene regulation covers all environments, various processes, which allow harmful substances in an organism, though these regulations rarely cover combined impact (meaning parallel or consecutive effects of several substances through a single entry channel) and covers neither effects of integrated impact , (meaning harmful substances entering an organism through different channels, i. e. air, water, food, skin), nor a combination of effects of different characters (physical, chemical, biological). 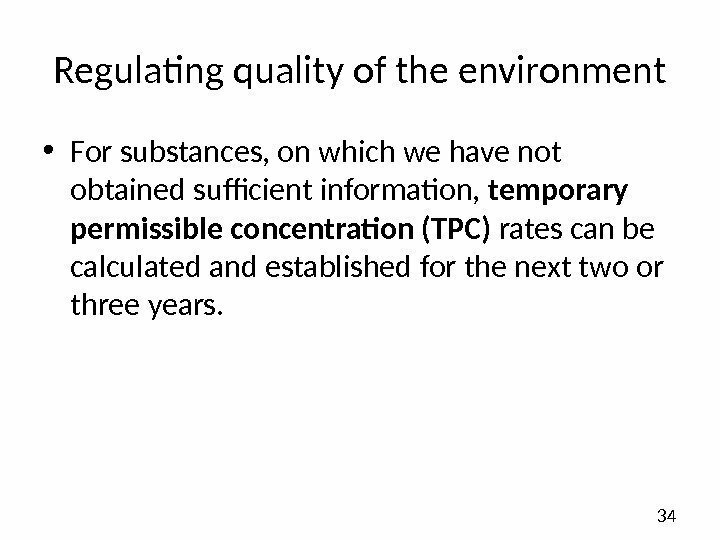 34 Regulating quality of the environment • For substances, on which we have not obtained sufficient information, temporary permissible concentration (TPC) rates can be calculated and established for the next two or three years. 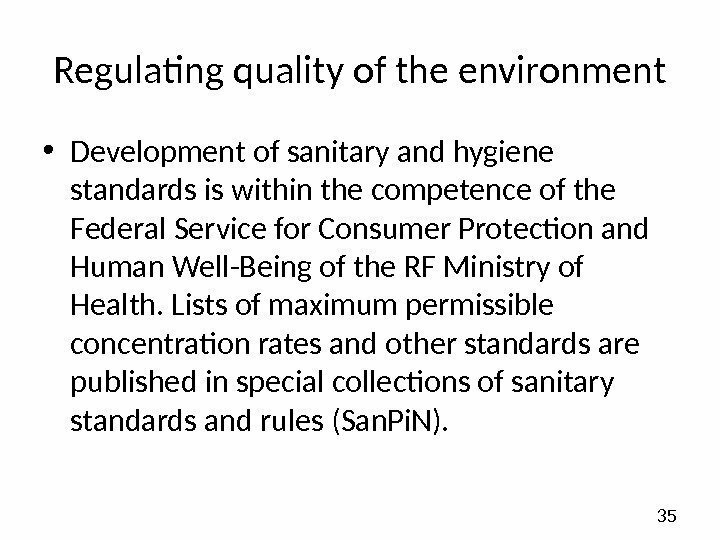 35 Regulating quality of the environment • Development of sanitary and hygiene standards is within the competence of the Federal Service for Consumer Protection and Human Well-Being of the RF Ministry of Health. Lists of maximum permissible concentration rates and other standards are published in special collections of sanitary standards and rules (San. Pi. N). 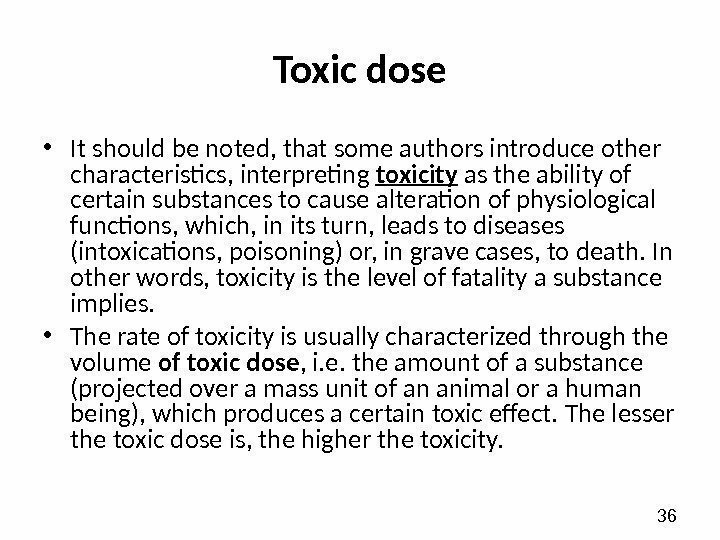 36 Toxic dose • It should be noted, that some authors introduce other characteristics, interpreting toxicity as the ability of certain substances to cause alteration of physiological functions, which, in its turn, leads to diseases (intoxications, poisoning) or, in grave cases, to death. In other words, toxicity is the level of fatality a substance implies. 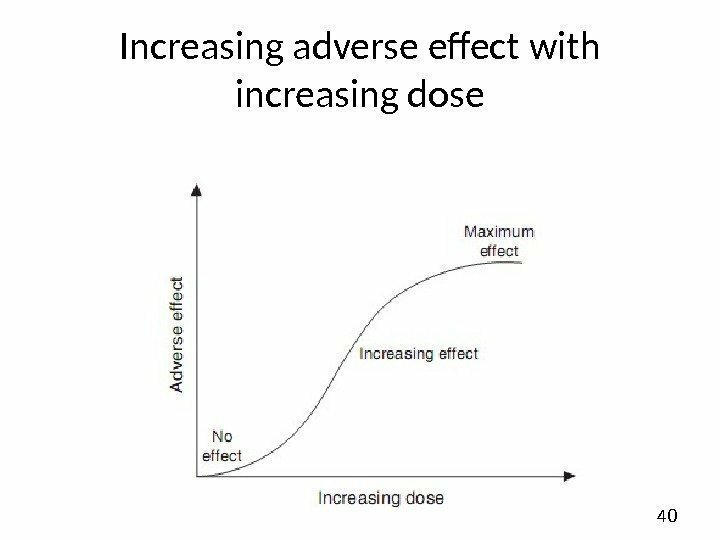 • The rate of toxicity is usually characterized through the volume of toxic dose , i. e. the amount of a substance (projected over a mass unit of an animal or a human being), which produces a certain toxic effect. The lesser the toxic dose is, the higher the toxicity. 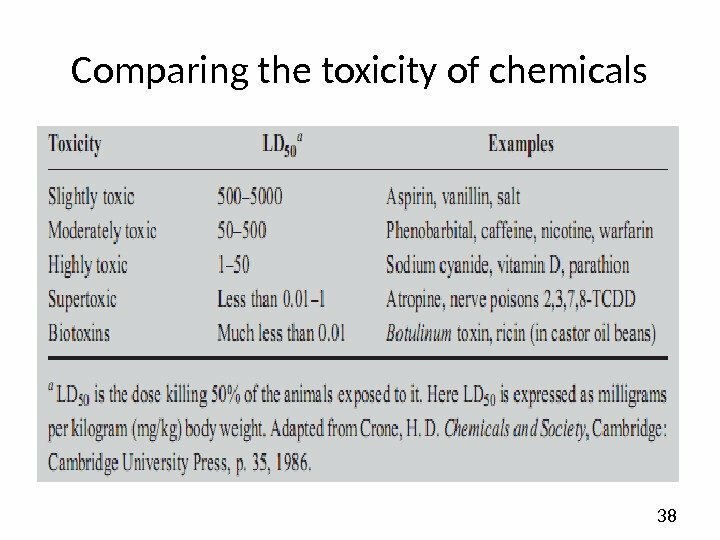 37 Toxic dose • There are median lethal doses (LD 50), absolutely lethal doses (LD 100), minimal lethal doses (LD 0 -10), etc. The figures in the index stand for the likelihood (%) of a certain toxic effect, i. e. the likelihood of death in the group of test animals, in this case. 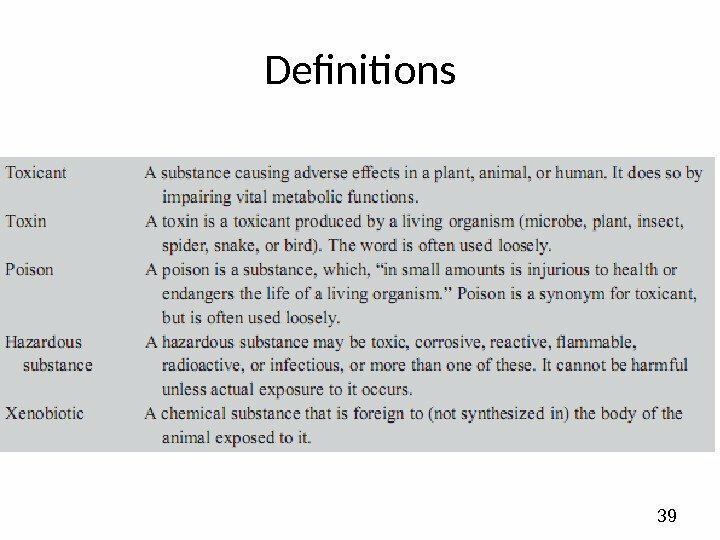 It should be noted, that the amount of toxic doses depends on how a substance enters an organism. 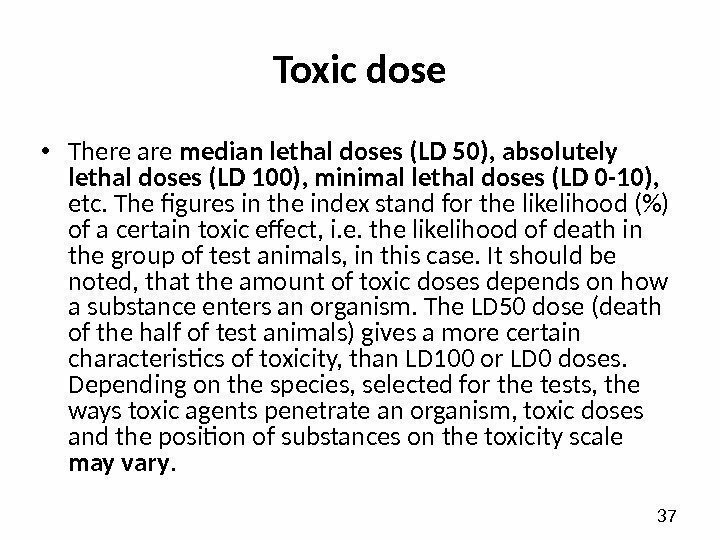 The LD 50 dose (death of the half of test animals) gives a more certain characteristics of toxicity, than LD 100 or LD 0 doses. Depending on the species, selected for the tests, the ways toxic agents penetrate an organism, toxic doses and the position of substances on the toxicity scale may vary. 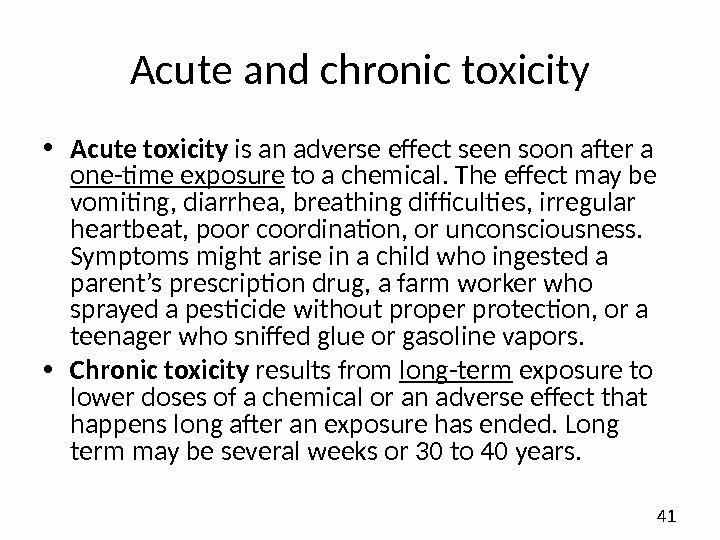 41 Acute and chronic toxicity • Acute toxicity is an adverse effect seen soon after a one-time exposure to a chemical. The effect may be vomiting, diarrhea, breathing difficulties, irregular heartbeat, poor coordination, or unconsciousness. Symptoms might arise in a child who ingested a parent’s prescription drug, a farm worker who sprayed a pesticide without proper protection, or a teenager who sniffed glue or gasoline vapors. • Chronic toxicity results from long-term exposure to lower doses of a chemical or an adverse effect that happens long after an exposure has ended. 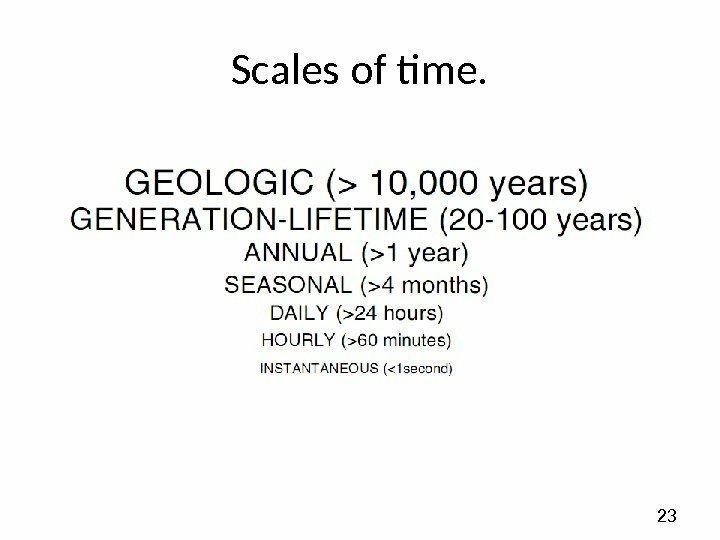 Long term may be several weeks or 30 to 40 years. 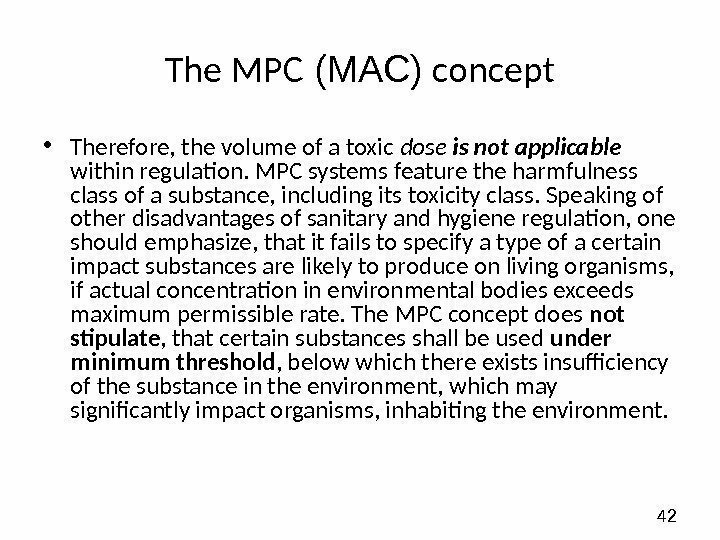 42 The MPC (МАС) concept • Therefore, the volume of a toxic dose is not applicable within regulation. MPC systems feature the harmfulness class of a substance, including its toxicity class. 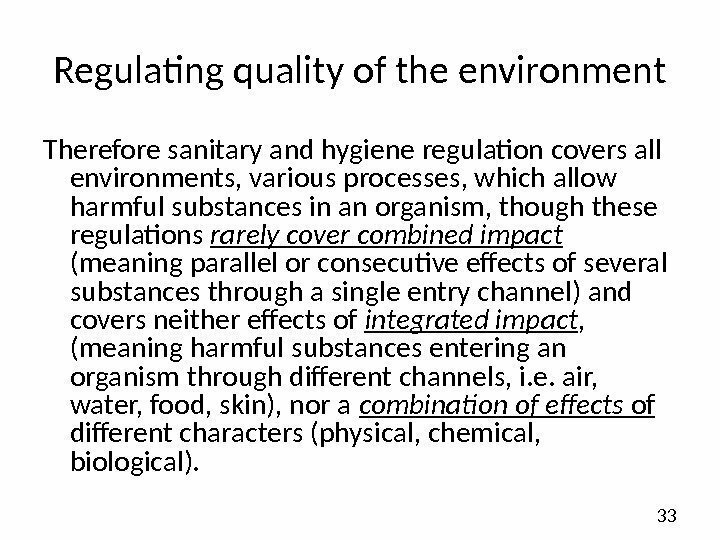 Speaking of other disadvantages of sanitary and hygiene regulation, one should emphasize, that it fails to specify a type of a certain impact substances are likely to produce on living organisms, if actual concentration in environmental bodies exceeds maximum permissible rate. 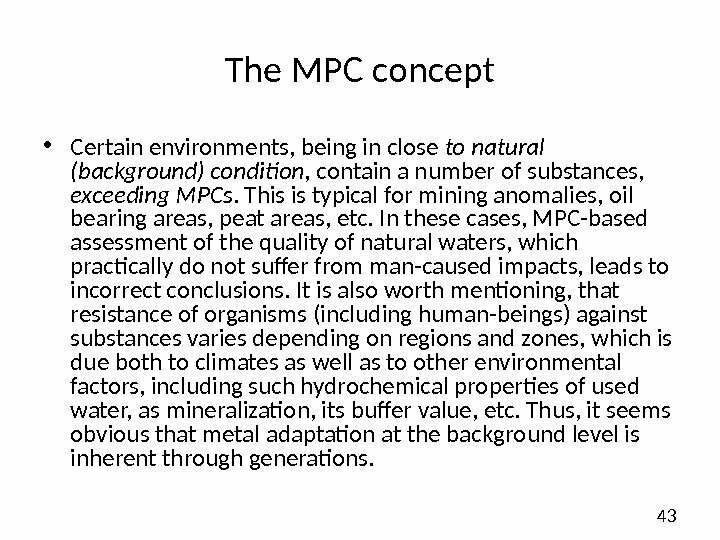 The MPC concept does not stipulate , that certain substances shall be used under minimum threshold , below which there exists insufficiency of the substance in the environment, which may significantly impact organisms, inhabiting the environment. 43 The MPC concept • Certain environments, being in close to natural (background) condition , contain a number of substances, exceeding MPCs. This is typical for mining anomalies, oil bearing areas, peat areas, etc. In these cases, MPC-based assessment of the quality of natural waters, which practically do not suffer from man-caused impacts, leads to incorrect conclusions. 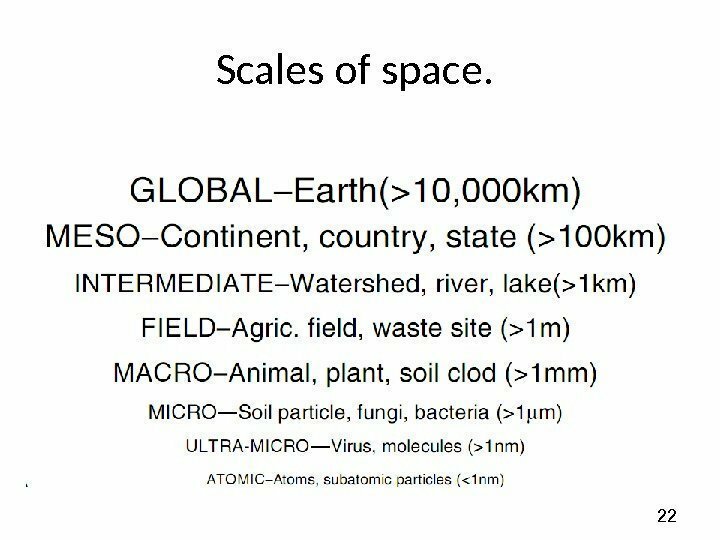 It is also worth mentioning, that resistance of organisms (including human-beings) against substances varies depending on regions and zones, which is due both to climates as well as to other environmental factors, including such hydrochemical properties of used water, as mineralization, its buffer value, etc. Thus, it seems obvious that metal adaptation at the background level is inherent through generations. 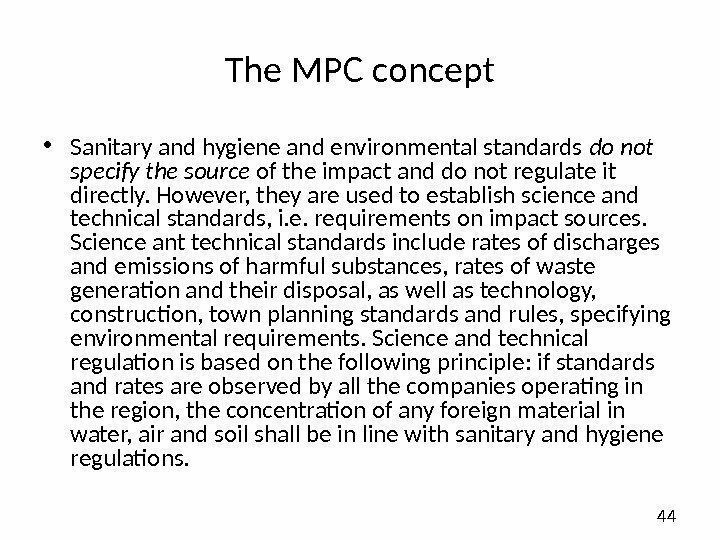 44 The MPC concept • Sanitary and hygiene and environmental standards do not specify the source of the impact and do not regulate it directly. 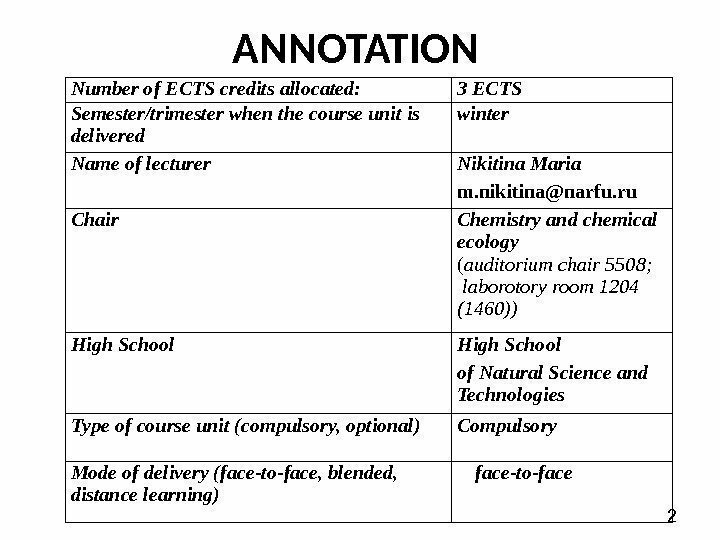 However, they are used to establish science and technical standards, i. e. requirements on impact sources. Science ant technical standards include rates of discharges and emissions of harmful substances, rates of waste generation and their disposal, as well as technology, construction, town planning standards and rules, specifying environmental requirements. Science and technical regulation is based on the following principle: if standards and rates are observed by all the companies operating in the region, the concentration of any foreign material in water, air and soil shall be in line with sanitary and hygiene regulations. 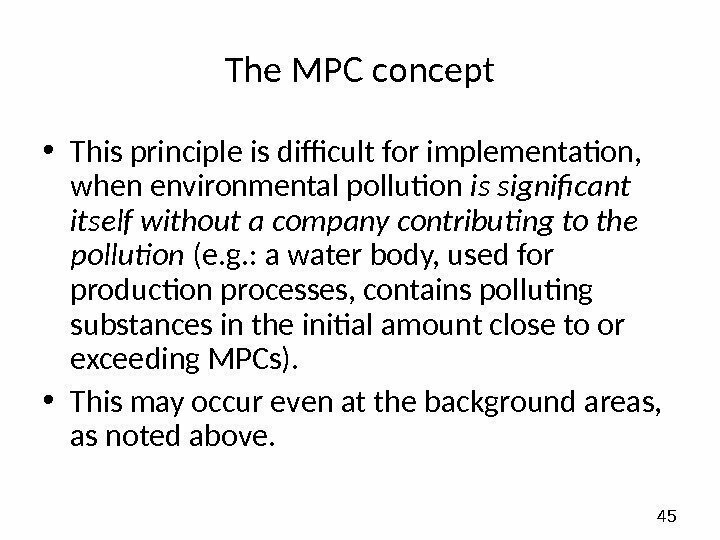 45 The MPC concept • This principle is difficult for implementation, when environmental pollution is significant itself without a company contributing to the pollution (e. g. : a water body, used for production processes, contains polluting substances in the initial amount close to or exceeding MPCs). • This may occur even at the background areas, as noted above. 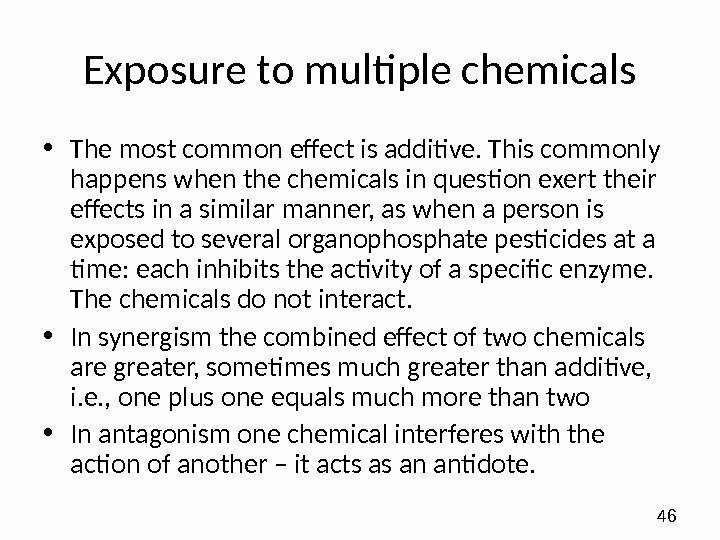 46 Exposure to multiple chemicals • The most common effect is additive. This commonly happens when the chemicals in question exert their effects in a similar manner, as when a person is exposed to several organophosphate pesticides at a time: each inhibits the activity of a specific enzyme. The chemicals do not interact. • In synergism the combined effect of two chemicals are greater, sometimes much greater than additive, i. e. , one plus one equals much more than two • In antagonism one chemical interferes with the action of another – it acts as an antidote. 47 Systemic and local effects Typically systemic effects are being referred to – effects occurring at a point distant from where a chemical enters the body. For example, cyanide, arsenic, and other toxicants exert their poisonous effects after being absorbed into the body. Local effects too – effects occurring at the point of contact with skin, eyes, lungs, or gastrointestinal (GI) tract. Aweak acid for instance is an irritant at the point of contact; it shows a local effect. 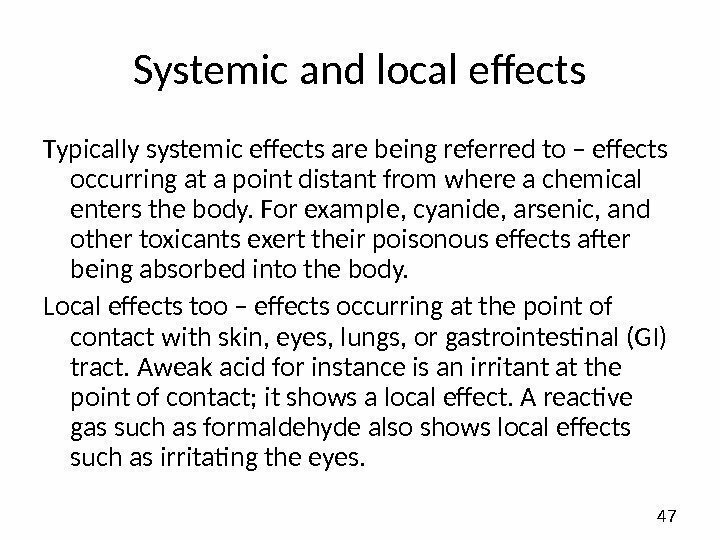 A reactive gas such as formaldehyde also shows local effects such as irritating the eyes.